Sideband is an electroacoustic ensemble, comprised of composer-performers dedicated to exploring the potential of the laptop orchestra. 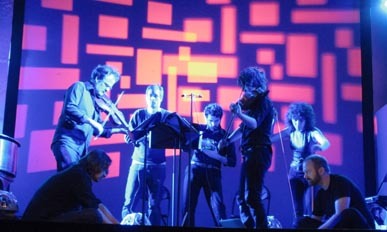 Praised by the New York Times for offering “a paradoxically visceral, endlessly engaging program of inventive pieces,” Sideband strives to inspire composers, performers and audience members to reevaluate the role of computers in music by designing instruments and compositions which utilize the unique capacities of networked electronic ensembles. Through the use of individual speakers, Sideband turns each member into a discrete sound source, recovering the acoustic presence of multiple instruments from the normally flattened world of electronic music. Ranging from solos and duos to sextets and beyond, Sideband is an evolving project that inspires composers, performers and audience members to reevaluate the role of computers in music. As the sibling ensemble to the Princeton Laptop Orchestra (formed in 2005 as a test lab for new methods of electronic and ensemble music-making), Sideband grew from PLOrk as an ensemble with a sustained membership and repertoire. Sideband members’ skills range from orchestral percussion to installation art, research in machine-learning algorithms, traditional Norwegian folk music, solo performance, electroacoustic music, software design, and scored composition. In 2014, Sideband released their first album, the Sideband Chronicles, which showcases a diversity and breadth of possibility in music for laptop orchestra. The Sideband Chronicles was conceived as an ongoing presentation of works written and performed by Sideband. In the fall of 2018, Sideband’s Bay Area tour will feature existing repertoire pieces alongside premieres of new works, using nontraditional controllers, wireless networking, graphic and text scores, video, and more.